Since the passing of her Husband, Dr. Richard Carlson, Kristine Carlson has been writing for the series, Don’t Sweat The Small Stuff. Don’t Sweat The Small Stuff is a successful series of books that share a mission to help you put your life into perspective, take responsibility, and find happiness with-in. For my review, I received the book Don’t Sweat The Small Stuff For Moms. Author Kristine Carlson shares Mom-to-Mom parenting advice and stores from raising her own children. Each chapter discusses a different issue that Mom’s usually face at some point in their life. Some of my favorite chapters were- There’s no such thing as a “perfect Mom, Mom takes a timeout!, Minimize your Mama drama, and You are enough as you are. Kristine hopes that by reading this book, Moms are able to find some useful tips to reduce stress in their lives, gain the ability to see all the blessings we have in our lives and to truly be grateful for each day that we have with our families. Being a Mom can be challenging, rewarding, lonely, overwhelming, and inspiring all at the same time. Their have been MANY moments I have wondered if I am doing a good enough job for my two Daughters. I know that there is no one right way to parent but, I can’t help but wonder if I am doing it the “right way” for them. Reading Don’t Sweat The Small Stuff For Moms reminded me that I need to forgive myself for making mistakes but, also commend myself for the job I have done thus far. Reading Kristine’s personal stories was comforting for me to read. I know I will have many more parenting challenges ahead and it’s nice to know that I can turn to this book for some kind and gentle parental advice. 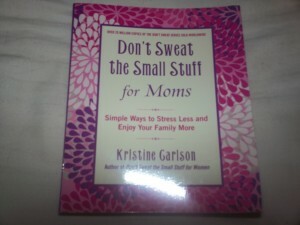 You can find Don’t Sweat The Small Stuff For Moms on Kristine’s website, facebook, and twitter pages.